The King Plus LED grow light with 2000w is here replacing lights with 3 or 5 watt LED diodes. This King Plus 2000w comes with a spectrum and coverage area that is ideally suitable for planting and growing. King plus 2000w LED has an efficient cooling system which keeps your grow room cooler and the power bill lower compared to a HPS/HID. 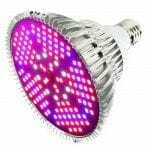 For a good indoor LED grow light, you should go for a sturdy light with good brightness, spectrum and coverage. The King Plus LED series holds all these features. Let’s read on to learn more on the King Plus 2000w LED grow light. We also wrote reviews on different versions of the King Plus LED series. Read about the King Plus 600w, the King Plus 1000w and King Plus 1200w if you’re looking for less powerful options. Let’s read about all the features the King Plus 2000w LED grow light has to offer. We will tell you why this light is so popular on Amazon and what all the pros and cons are. The King plus 2000 watt LED grow light is scientifically engineered to provide high efficiency. This light replaces a traditional 3w or 5w LEDs while maintaining the right balance of PAR/Lumen output. The 2000 watt LED grow light consumes only 380 watts (equal to 0.38 kW/h) which means that this light is way more energy efficient than a HPS/MH grow light. 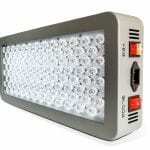 King plus 2000w LED grow light comes with a collection of 200 LEDs of 10 watts each. Furthermore, this collection of LEDs provides a full-colour spectrum and an intense light. 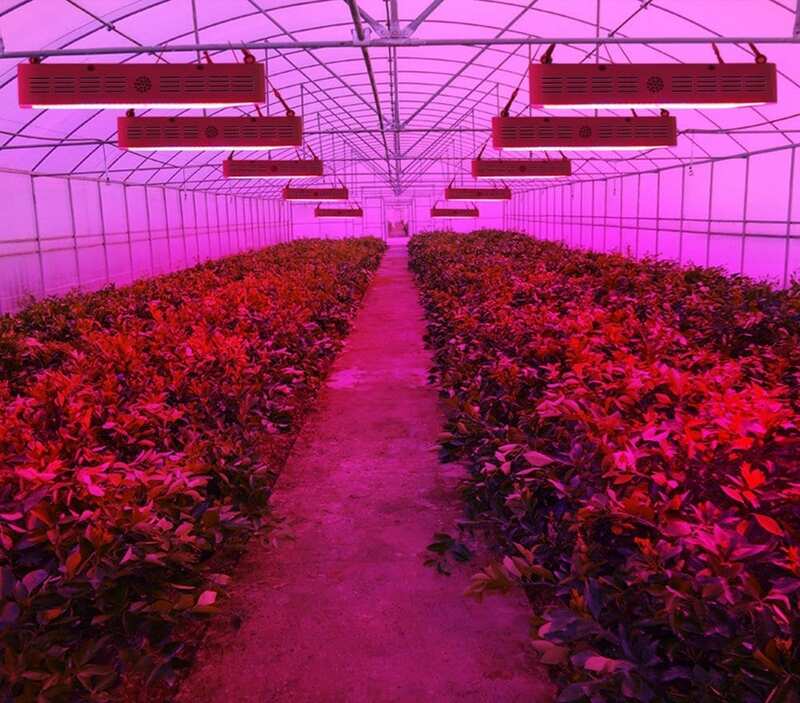 In addition, the UV and IR spectrum maintains a steady and sustainable plant growth. 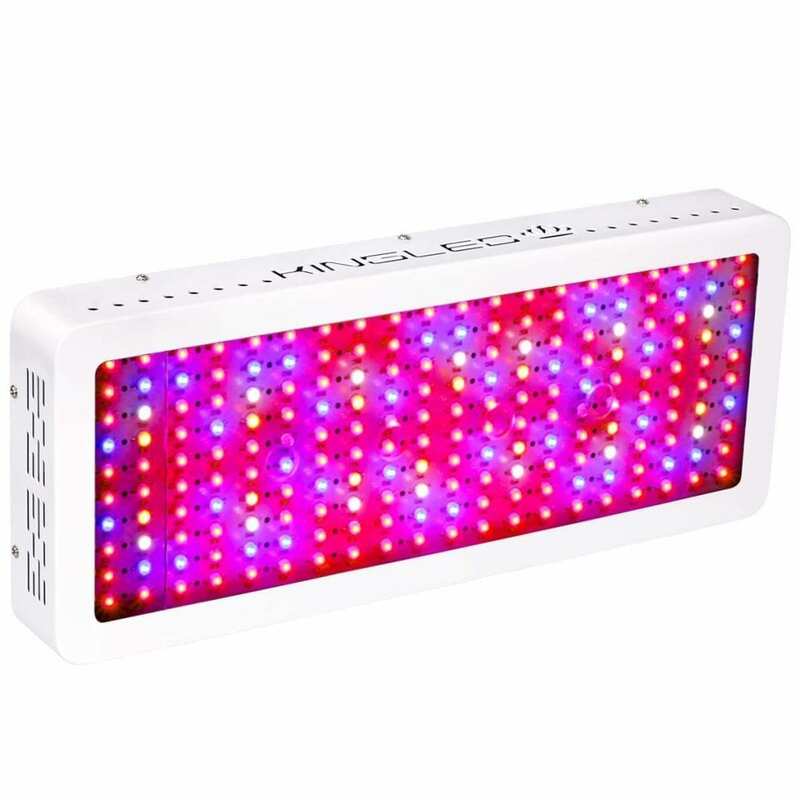 It speeds up the process compared to completely natural light if you use the 2000w LED grow light correctly. 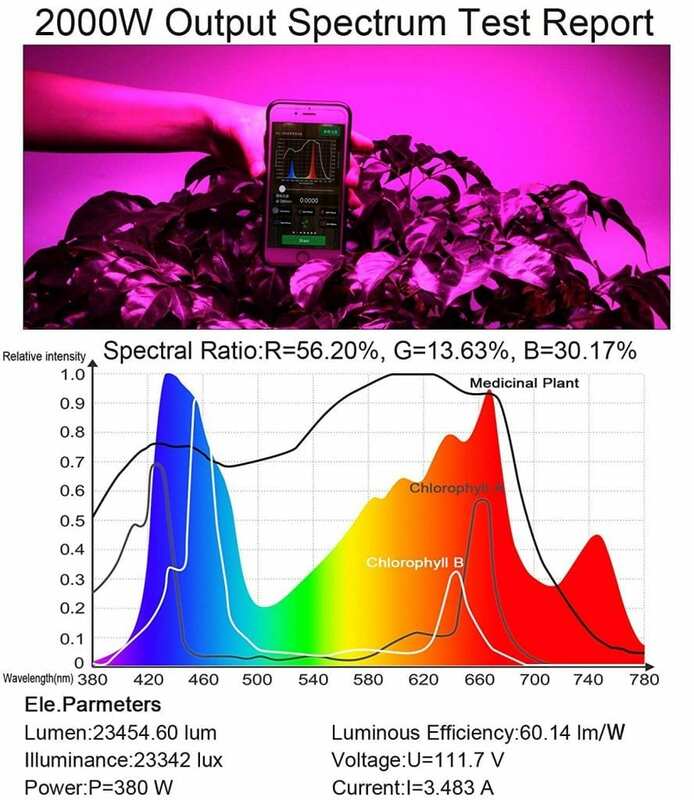 The color bands range from 410nm to 730nm. 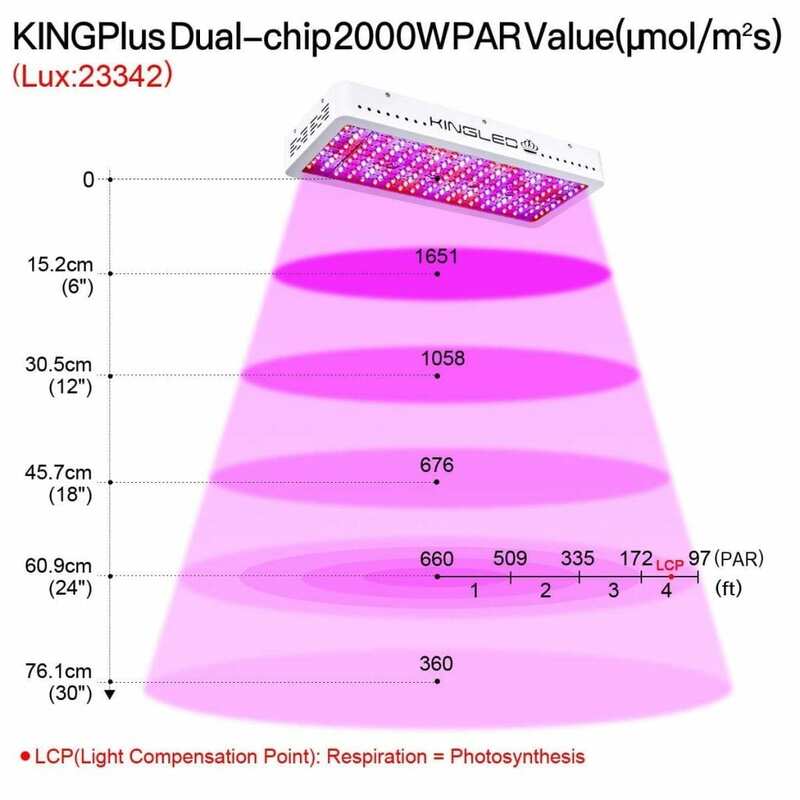 The King Plus 2000w LED provides exactly the right spectrums to enable photosynthesis and minimize power consumption. The light spectrum not only makes it an advanced light, but also does exactly what you expect it to do. Moreover, the dual chip technology gives a brighter light than usual 3w or 5w LED diodes. The coverage area for the light is about 4.5×8 feet. 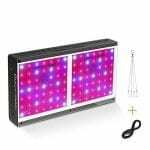 Therefore, this 2000 watt LED grow light is perfect for a 4×8 grow tent. Generally, this lighting area is dependent on the plants and the hanging height. This area pretty much covers up most plants for optimal growth. The King Plus 2000w is useful for the vegetative, flowering and blooming stage. King Plus LED recommends using this light in the various phases for respectively 12-14 hours, 9-12 hours and 7-8 hours. This is a broad indication and not correct for all plants. Experiment with your plants to discover the right settings. Keep this in mind with every LED grow light brand that makes recommendations. An efficient cooling system is there to keep your light cool, prevent damage of light and plant and make keeping control of your light easy. 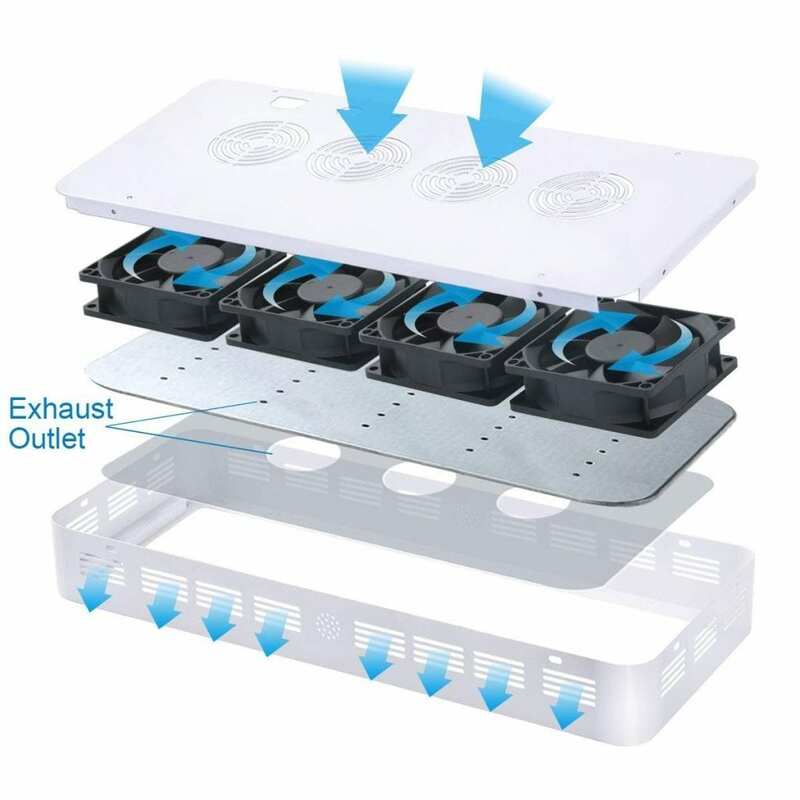 The King Plus 2000w has holes and glass form convection with fans. Consequently, this helps in heat dissipation. Furthermore, the resistance of every LED diode also makes them work separately. Do you want to get a short overview on this King Plus 2000w LED grow light? Check out the video below to get all the important features in images and video! Overall, the King Plus 2000w is a very good light with nice features. This LED grows light is a must-have for all beginning cultivators, growers, and planters out there. 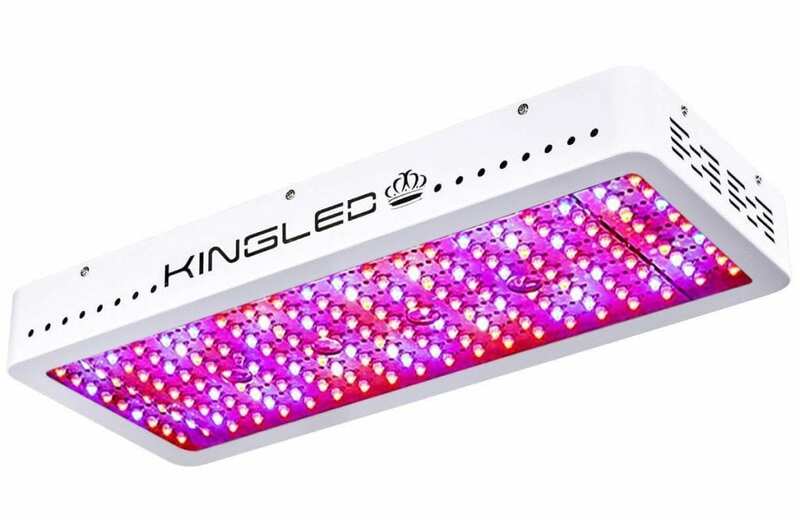 The King Plus 2000 watt review shows that this LED grow light has all the essential features you need. If you are a beginning grower with a bit of a larger area, this is the light you need. Check Amazon to get the best price and to buy it from a reliable vender. Are you looking for tools to make growing easier? Check our reviews of bud trimmer machines and carbon filters, for example. Just starting out with growing? Check our complete guide on growing hydroponically indoor.